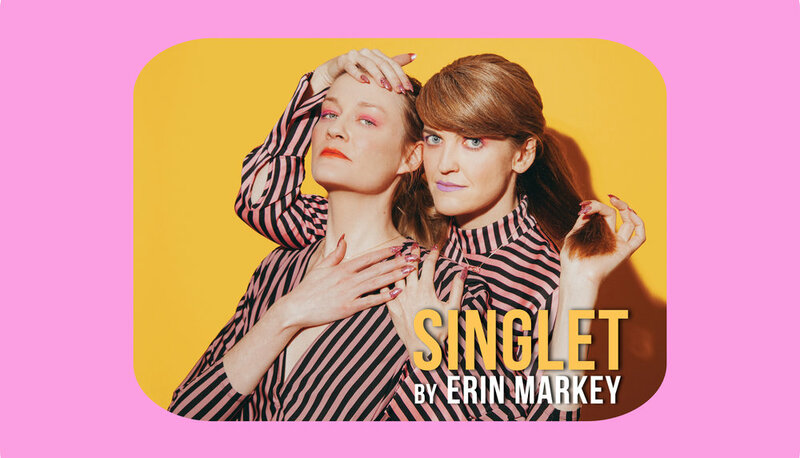 In SINGLET, genre-defying artist Erin Markey draws on their longstanding friendship and working relationship with actor Emily Davis to create a performance that maps the bonds and hysteria of earned intimacy. Combining Markey’s singular style with a host of influences—spanning Genet’s The Maids, celebrity psychotherapist Esther Perel’s available-on-Audible couples counseling sessions, Notes on a Scandal, Elena Ferrante’s Neopolitan Quartet and Precious Moments® Collectible Dolls — this kaleidoscopic world premiere production grapples with the desire, rivalry, vulnerability, and subterfuge that bind two people together. By turns tenacious and tender, SINGLET reimagines the economies of power between friends, families, and wrestlers. Scenic design by Carolyn Mraz, Costume design by Enver Chakartash with Carter Kidd, Lighting design by Barbara Samuels, Sound design by Jeff Aaron Bryant with Keenan Hurley, Original Music by Jeff Aaron Bryant and Erin Markey, Choreography and movement by Chloe Kernaghan, Stage management by Kedian Keohan, Production management by Ann Marie Dorr, Scenery fabricated by The Lab Scenic Studio, Produced by un sphinx incompris (David Bruin, Artistic Director; Tessa Jane Lee, Assistant Producer).